Fairness and respect in a workplace are important for both an organization and employees. I track global laws and developments in the workplace bullying, harassment, discrimination and stress fields and work at an environmental, health and safety consultancy in Boston MA. I have also worked as a neutral in the employment discrimination law field. Have been interested in fairness and respect in the workplace much of my legal career. Led me to write my book Workplace Bullying and Harassment: New Developments in International Law (2017) and to work in the employment discrimination law field where I drafted decisions for the MA Commision Against Discrimination. At my present job at an environmental, health and safety consultancy, I notice how health and safety is increasingly encompassing psychological risks in many parts of the world. 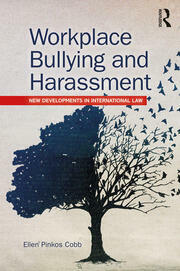 Workplace harassment, bullying, discrimination, violence, and stress. Founding Fellow US Workplace Bullying Academy. Editing of manuscripts, fiction, nonfiction, reports, regulatory documents. Certified equal employment opportunity investigator. Reading, writing, spending time with family, and at the beach.